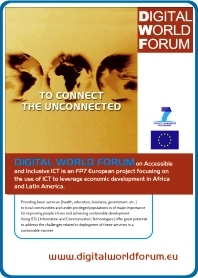 The objective of the project's outreach work package (WP4) is to create the conditions for future successful implementations of the defined roadmaps in the other work packages: WP1 (mobile Web for development), WP2 (low-cost access devices) and WP3 (low-cost broadband and infrastructure). The outreach activities are related to the identification of relevant actors that could launch the recommended initiatives described in the roadmaps, the selection of appropriate methods of disseminations depending on the type of actors, and the launch of appropriate long-term cooperation structures. organizing an event near the completion of the project (September 09) gathering all stakeholders, for enabling new directions of work to help ICT in developing countries. Download the DWF flyer (one page - A4 format).